An early masterpiece by artist Paul Gauguin - which has only been seen in public twice in nearly 140 years - will be auctioned in Paris next month. "Pissarro's Garden" is a touching tribute to the older Impressionist master, Camille Pissarro, experts say, who Gauguin called his "dear teacher". 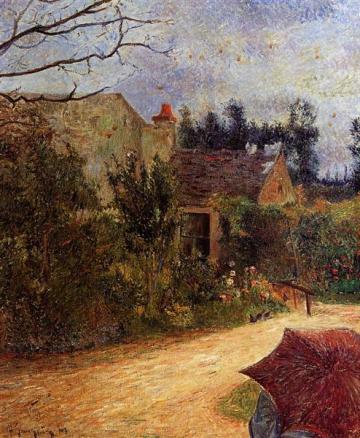 It shows a figure hidden under an umbrella outside an old country cottage near Pontoise, which is now a suburb of Paris. Sotheby's, which is selling the rare painting from 1881 which has two self-portraits of Gauguin on the back, said Pissarro "often painted beneath an umbrella, as portrayed in many works and images showing the artist in Pontoise. "This is more than a landscape, it is Gauguin's homage to his teacher... and is a testament to the friendship between those two great figures of modern art," it added. Gauguin often stayed in Pontoise with Pissarro as he learned technique from the old master, who also helped launch his career. Christophe Duvivier, who heads the Pissarro Museum in Pontoise, said "with Pissarro Gauguin learnt to see landscape and summarise it". The painting has been in the same family collection since the 1920s, Sotheby's said, and has only been seen twice in public: once in France in 1964 and in a hit US show at the Cleveland Museum of Art in 2015.